Holy Trinity church is situated just off Goodramgate and dates back as far as the 15th century. Inside the church is interesting for it has irregular shaped box pews. You can get to the church from Goodramgate or from Petergate using Hornpot Lane next to the Poundland shop. Framed by trees the ruins of St. Mary's Abbey are in the Museum Gardens. The gardens were set up by the Yorkshire Philosophical Society as a botanical garden shortly after they were formed in 1822 and the Museum was built in 1829. The museum is known as the Yorkshire Museum and is administered by York Museums Trust which is an independent charitable trust which manages York Castle Museum, Yorkshire Museum and Gardens, York Art Gallery and York St Mary's. When entering from the Marygate entrance this is the first glimpse of the ruins of the ruins of the Benedictine St. Mary's Abbey. Following on from yesterdays post on the entrance to the Museum Gardens, here is St. Olaves Church in Marygate dedicated to St. Olaf. You can see the Museum Gardens entrance on the right of the picture. This entrance into the Museum Gardens goes into the gardens from Marygate next to St Olaves Church. A warm sunny autumn day and the River Foss is barely moving; providing a good mirror surface to reflect the structure of the bridges at Foss Islands. Years ago there were several hump back bridges linking the junctions and they were dreaded by learner drivers in case they stopped in traffic and had to hill start on the humps. It is sad how this once great public house with so much going on with a friendly atmosphere was allowed to deteriorate to the point where it had very few customers and ended up closing. Now the owners are planning to convert it into yet more flats. Here is a section of the Minster that has been repaired and refurbished with new stonework. The left hand photo shows new blocks that have been cut and shaped ready to be inserted whilst the right hand photo shows sections that have been removed because they are highly eroded. York Minster is made from Magnesian limestone which is easier to work than normal limestone. Magnesian limestone also has the disadvantage that it is slightly more soluble than ordinary limestone and so with slightly acidic rainfall over the years the stonework slowly dissolves and erodes. In the second row from the right you can see the heavy erosion on the sixth block back. For a closer look, click on the photograph to see a larger version in the Picasa web album. I saw this girl walking through the Museum Gardens clutching this small decorative chest of drawers but missed the opportunity to get a picture. When I got round into Exhibition Square there she was sitting at the bus stop amongst the autumn leaves on the wall with her decorative chest of drawers wearing headphones. I couldn't resist an so I just had to take a photo. When visiting York watch out for markers like this that indicate points where you can gain access to parts of the city walls. St. Saviourgate is an interesting little street that most folks miss unless they are heading to DIG just along the road from the Methodist Chapel. It is well worth a small detour along this street as there are many intersting buildings. This is an intruiging place in Piccadily used as a second hand furniture shop. It is one of those places where you can spend ages just browsing around, sometimes you might see something that will interest you and sometimes you will not. The name derives from a former use of the building as a fruit and vegetable wholesaler who used to run a business from here. Wallace is the name that springs to mind though I may be wrong, there was also another fruit and veg wholesaler in Swinegate and may be mixing up with them. Wallace used to have green trucks of about five ton capacity that did the rounds of the shops in the countryside. The driver that came to our village was Tom Turpin and most people thought of the business as being Tom's as he seemed to have a fairly free hand to set prices for each customer as he saw fit without instruction from his boss in York. Sadly, as the village sjops declined the business dissapeared. During mediaeval times the craft guilds were an important part of the life of the city. The Merchant Taylor's hall is situated next to the city walls beside the archaeological diggings of the Eastern tower of the Roman Fort of Eboracum. The hall is a popular venue for wedding receptions and events nowadays. St Crux church hall stands in a little green island in an otherwise heavily built up area. The foreground to the right is the shortest street in York Whip Ma Whop Ma Gate and to the left you can see the shutter doors of Marks and Spencer's goods entrance at the bottom of the famous Shambles. It can be irritating if you are driving along Pavement and there is a delivery lorry trying to get into the loading bay as it is a tight fit with very little room to manouever. 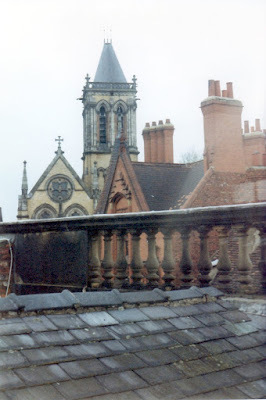 This view was taken from the roof car park of the ugliest building in York looking along Pavement to All Saints church the Dragoons chapel. On the right hand side is the rear entrance to Marks and Spencer. If you click on the photograph and then look at an enlargement of it in the Picasa web album you should be able to make out the sheep sign of the Golden Fleece on the right about a quarter of the way up the photograph. St Helen's Church looks out over St. Heln's Square towards the Mansion house. Historic indications show that a church has stood on this spot since the 12th century. It has a history of change and rebuild over the centuries until we see the wonderful building that now stands. It was the chapel for glass painters in mediaeval times. The area that is now St. Helen's Square was part of the churchyard. There is now a separate walled garden in Davygate where headstones from that churchyard can be viewed. The Treasurers House is one of the historic properties in York maintained by the National Trust. Entrance to the house is via Chapter House Street a narrow cobbled street unsuitable for large heavy vehicles. You can get into Chapter House Street either from Ogleforth or the south end of the Minster near St Williams College. A third option is to gain access via the Dean's Park, entering near the north end of the Minster from Petergate by the Purey Cust hospital. Originally the building was made to house the Treasurers of York Minster, hence the name. The house was built over the ruins of a Roman Road and it is said that you can see the ghosts of a Roman legion marching through the cellars of the house. Because the Roman Road is lower than the floor of the cellar you only see the legion from the knees upward. You can read more of the details about the history of the house and find out about things like opening times and admission prices by using the Treasurers House link. Watch out for this plaque commemorating John Goddricke an important figure in the history of astronomy. One the colleges of York university "Goodricke College" also commemorates his name. The plaque can be found on the outside wall overlooking the small street between Treasurers House and the Minster. This is the ornate entranceway into Treasurers House located in Chapter House Street, seen here in the early morning before opening for the public. This is a building that has always intrigued me the way the left hand half mirrors the slope of the road whilst the right hand side mirrors the horizontal. The arch over the doorway to theleft also adds interest to the building. Three Tuns is a popular name for pubs in England and you find many such named pubs around the country. A Tun is a large brewing vessel e.g. Mash Tun where grains used in brewing are treated with hot water (liquor) to extract sugars for the fermentation process., or the lautering Tun which is used for coarse filtration of the fluid from the mashing process. The Three Tuns in Coppergate is just up the road from the All Saints Church on the opposite side of the road. Coney Street is probably the most popular shopping street in York. It is absolutely heaving on Saturday afternoons with shoppers. Most of them are focused on their shopping and miss the architecture and design features that are above their line of vision. I know it is becoming like a mantra with me, but, "lift up your eyes and look at the floor levels above the ground floor". This wonderful bit of building is above Boots the Chemist and was plainly two adjacent buildings in an earlier time before being knocked through into one large building that turns through ninety degrees and has a separate entrance in Feasegate. 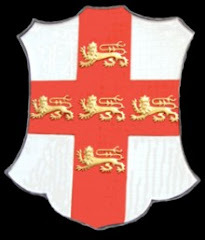 The coat of arms of the city can be seen on the left hand side of the right window and the Cross Keys seal of St. Peter(York Minster is dedicated to St. Peter) on the right hand side. Just between the two Haxby Road clocks mentioned in yesterday's blog is the Joseph Rowntree Memorial Library. The library was set up for the use of workers in the Rowntree factory. officcs and laboratories being open at lunch times for workers to use. During the day the library staff also provide a comprehensive techical library service for the business. This clock stands at the edge of the Nestle Rowntree site in Haxby Road outside what used to be the entrance to the Melangeur area of the factory. There is a simialr clock just a little further down the road by what was once the main entrance to the factory on Haxby Road. Just lately though the bushes and trees around the second clock have become so overgrown that the clock is starting to disappear. Behind the rather run down area Piccadily, that includes the second most ugly building of York, Ryedale House. The lines of decay and ugliness are softened by the willow trees along the bank as the river runs along the final stretch before meeting the River Ouse at Blue Bridge. A good way for tourists to get an overview of York is to use the sightseeing buses. There are three companies operating in York. They are York Tour, York City Sightseeing and York Pullman City Tour. They all use open topped double decker buses and you buy a ticket and hop on and off at any of the bus stops around the city. The photo above is the stop in Stonebow where several routes have stops. You can just see the ugly concrete of the Stonebow building intruding into the left hand edge of the photo. I suppose that you could class Stonebow as an open air bus station although it doesn't serve any of the routes that head north out of the city. The York branch of the National Osteoporosis Society donned their "Team OSteoporosis" T shirts and visited the St. Sampson's Over 60s Centre in Church Street to provide advice and put on a play about the problems of Osteoporosis. Osteoporosis literally means ‘porous bones’ and can affect both men and women though primarily women. Not all of York is pristine and well kept, this building in Piccadily just next to the River Foss beside the Coppergate centre is suffering from proposed redevelopment being blocked by various protesters that rightly want the redevelopment to be sensitive to it's surroundings and proximity to Clifford's Tower. So whilst the debate goes on the building is deteriorating in the beleif that it is not worth doing anything with it as it will be demolished sometime. This view of St Wilfred's is taken from the same place that the "Minster viewed over rooftops" photo was taken. The red brick building with the tall chimneys in the middleground is Grays' solicitors on the corner of Duncombe Place and Blake Street. Have you ever wondered where theycut up and carve all those bits of stone when they are restoring and replacing bits of York Minster. It happens here in the stone yard next to the Minster School. I missed the open day this year so I'll have to try harder next year to make sure I get a look round inside instead of just seeing the view from the gateway! Following on from yesterday's post where I mentioned Fairfax House so here is the exterior of Fairfax House. The building was restored by York Civic Trust and is now something well worth adding to your itinerary for a visit to York.